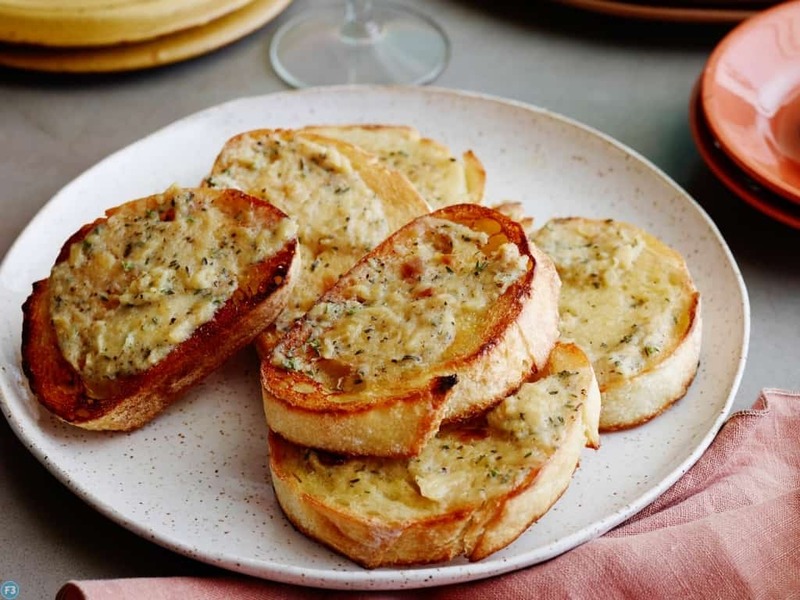 Garlic bread or garlic toast consists of bread, topped with garlic and olive oil or butter and may include additional herbs, like chives. After that, it is grilled or broiled until toasted or baked in a conventional or bread oven. When I was growing up one of my favorite meals was any meal with my Mom’s garlic bread. My Mom made a garlic bread that would have warded away vampires for a long time. Her ingredients were simple, she used butter, fresh garlic, garlic powder, and parsley. I think her secret was allowing the butter to simmer slowly for a long time. Persian soldiers were bakers! Those shields apparently made pretty darn good bread pans on which they baked a flatbread that they would then cover with various toppings (such as garlic). Nowadays, a variety of cheeses such as mozzarella, cheddar, and feta are used as toppings on the bread. 1 Preheat oven to 350°F. Cut the bread in half, horizontally. 2 Spread with garlic butter parsley mixture: Mix the butter, garlic, and parsley together in a small bowl. Spread butter mixture over the the two bread halves. 3 Heat in oven for 10 min: Place on a sturdy baking pan (one that can handle high temperatures, not a cookie sheet) and heat in a 350°F oven for 10 minutes. 4 Sprinkle with Parmesan and broil: Remove pan from oven. Sprinkle Parmesan cheese over bread if you want. Return to oven on the highest rack. Broil on high heat for 2-3 minutes until the edges of the bread begin to toast and the cheese (if you are using cheese) bubbles. Watch very carefully while broiling. The bread can easily go from un-toasted to burnt. 5 Slice: Remove from oven, let cool a minute. Remove from pan and make 1-inch thick slices. Serve immediately. 1 Preheat oven to 350°F. Make the butter, garlic, parsley mixture as above. 2 Make 1-inch thick slices into the bread, but do not go all the way through, just to the bottom crust. Put a teaspoon or two of the butter mixture between each slice, or between every other slice if you only want the garlic mixture on one side of the bread. 3 Wrap the bread in aluminum foil and heat for 15 minutes in the oven. 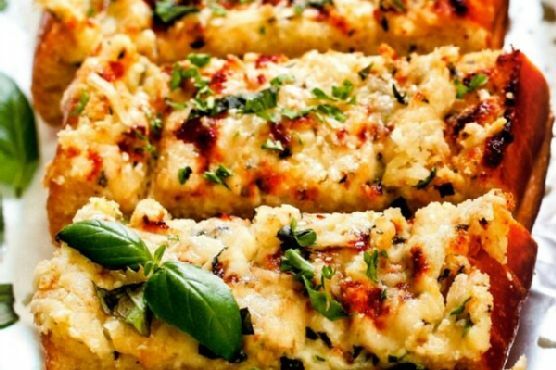 Butter, minced garlic, and parsley are the main ingredients that are used as a spread over the sliced bread. Parmesan cheese is used for sprinkling over the oven heated bread, which is broiled for the cheese to melt. This garlic bread is sliced after the bread has cooled. Preheat oven to 350°. Cook garlic in boiling water for 2 minutes. Remove and finely chop. In a small bowl mix garlic with butter, and mint or parsley. Spread butter mixture on cut sides of bread. Sandwich together. Bake until crusty and butter has melted about 10 minutes. Garlic knots are a type of garlic bread found primarily in pizzerias around New York City and the surrounding regions. They were developed in 1973 in Ozone Park Queens, as a way of making use of pizza dough scraps, and very quickly caught on. 1 Heat oven to 375°F. In small microwavable bowl, microwave garlic, butter, and oil on High 30 seconds or until butter are melted. Stir in basil and parsley; set aside. 3. 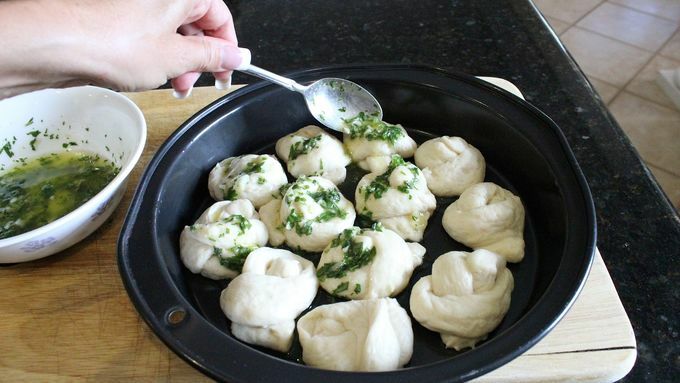 Spoon butter-herb mixture evenly over top of each knot. Sprinkle with salt and pepper. Cheesy Garlic Bread with three kinds of cheese, herbs, and tons of garlic.Use any bread & cheese of your choice. In a small bowl, mix butter, garlic salt, rosemary, basil, thyme, garlic granules and Parmesan cheese. Place bread halves, crusts down, on a medium baking tray. Bake in the preheated oven 10 to 12 minutes or until the edges are very lightly browned. Here’s a golden-brown crusty loaf that will round out all kinds of dinners in just minutes! I am a major fan of Costco, and I always like to buy their shredded Parmesan cheese. So the last few times when I made this garlic bread I sprinkled just a little bit of the shredded Parmesan cheese on top. I also would spread the butter on the sides of the cut bread so more of the bread would have the chance to get nice and crispy. In a small bowl, combine the butter, cheese and garlic powder. Spread mixture over cut sides of bread. Place on an ungreased baking sheet. Bake at 400° for 10-12 minutes or until golden brown. Serve warm.Yield: 4 servings. Garlic Zucchini Bread Recipe for breakfast, as a tea time snack, lunch box or even as an appetizer. By the way, did you try the Zucchini Bread recipe yet? … together grated zucchini, mozzarella cheese, parmesan cheese, egg and garlic salt. And let me tell you, kids will eat these cheesy sticks up and will not complain about the green-looking crust. Preheat oven to 425º and line a baking sheet with parchment. On a box grater or in a food processor, grate zucchini. Using cheesecloth or a dish towel, wring excess moisture out of zucchini. Transfer zucchini to a large bowl with eggs, garlic, oregano, 1 cup mozzarella, Parmesan, and cornstarch and season with salt and pepper. Stir until completely combined. 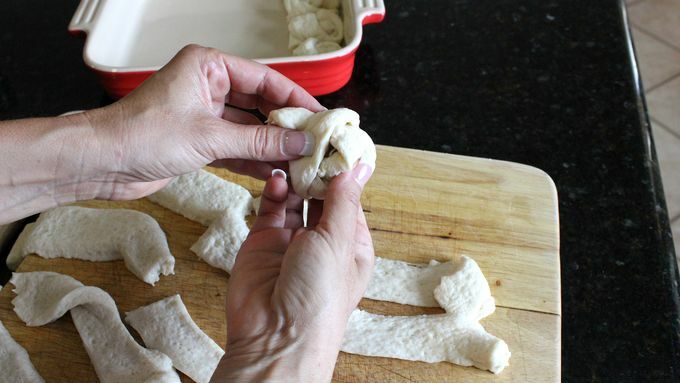 Transfer “dough” to prepared baking sheet and pat into a crust. Bake until golden and dried out, 25 minutes. Sprinkle with remaining 2 cups mozzarella, crushed red pepper flakes, and parsley and bake until cheese is melted, 8 to 10 minutes more.